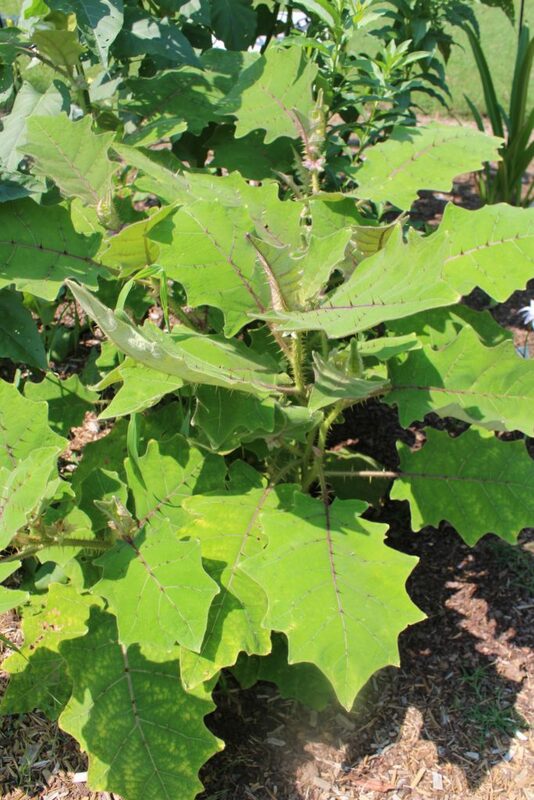 The Lulo or the Naranjilla is a herbaceous shrub that can grow to 8ft high, with stems becoming somewhat woody over time. It is native to the subtropical understories of the Andes of Ecuador, to Peru, and to southern Columbia. The first recorded use of the lulo is in the mid-17th Century, and only until now is it gaining more interest and cultivation in places outside of its native range like Panama and Guatemala. A spreading plant, the leaves can get up to 2 feet long and one-and-a-half feet wide, and are covered in fine hairs. Spines are characteristic of the plant, though depending on the cultivar, the amount can range from fully covering the plant to none at all. If grown in a tropical climate, they flower and fruit throughout the year, bearing hairy, golf-ball sized fruits around the stem that when ripe, after rubbing off the hair, reveal a thick, bright-orange peel. Inside is a very juicy, acidic, green to yellowish pulp with an alleged pineapple-lemon flavor that drives the cultivation of this fruit for commercial purposes. Besides taste, it also has high amounts of fiber, citric acid, minerals, and vitamins. Though it is not used to cure or specifically help with any ailments, the fruit is very nutritious, has antioxidant properties, and is full of fiber that aids digestion. One can eat a lulo fruit just by slicing the fruit in two and squeezing the pulp and juices out into one’s mouth, though they are also added as flavoring for native dishes, ice cream, sherbets, and other desserts. Traditionally in Colombia, people use frequently them as a beverage base in a drink called lulada, made with mashed lulos, lime juice, water, sugar, and ice. As a side note of caution when preparing the fruit, the hairs and spines of the plant can cause irritation for people with sensitive skin. Though demand for the lulo is high, it will unlikely ever become a commercial crop. Besides specific growing environments, it is a member of the nightshade family, a diverse and often very fragile group of plants, including many economically important species such as potatoes, bell peppers, tomatoes, and eggplants. The lulo is unfortunately not spared from its relatives fragile traits, and in its case it is very susceptible to root damage by nematodes. To combat this, farmers often have to raze forests for uncontaminated soil, causing significant damage to the area often resulting in erosion, which reduces both the productivity of the land and the production of the fruit. The largest site of cultivation is a only 15-mile stretch in Ecuador near an Amazon River tributary, which is nowhere near enough for mass production. And so, there are many attempts now with grafting and hybridizing lulo plants resistant to these nematodes to not only forward the great economic potential of this plant, but also the conservation of rainforests. Plants Profile for Solanum quitoense (Naranjilla), plants.usda.gov/core/profile?symbol=SOQU. Accessed 1 Mar. 2018. “Naranjilla.” Fruits of Warm Climates, Julia F. Morton, 1987, pp. 425–428, hort.purdue.edu/newcrop/morton/naranjilla_ars.html. Accessed 1 Mar. 2018. Forero, Diana Paola, et al. “Chemical and sensory comparison of fresh and dried lulo (Solanum quitoense Lam.) fruit aroma.” Food Chemistry, vol. 169, 15 Feb. 2015, pp. 85–91., www.sciencedirect.com/science/article/pii/S0308814614011595?_rdoc=1&_fmt=high&_origin=gateway&_docanchor=&md5=b8429449ccfc9c30159a5f9aeaa92ffb. Accessed 1 Mar. 2018. Heiser, Charles B. “Ethnobotany of the Naranjilla (Solanum quitoense) and its relatives.” Economic Botany, vol. 39, no. 1, 1985, pp. 4–11., link.springer.com/content/pdf/10.1007%2FBF02861168.pdf. Accessed 1 Mar. 2018.